Dunlap is located east of Fresno along highway 180 on the route into King’s Canyon. Launch is 4600 MSL and the LZ is 2000 MSL. It is located in the foothills of the Sierra mountains and is a great site for XC. All XC needs to be requested and approved by Dan Fleming and or the Central Valley Hang Gliding and Paragliding Association. This site can work year-round, but in stronger winters, snow can block access to the launch. The launch faces SSW. Mid-Day flying during summer months should only be done by expert pilots. Better yet, the site is great for morning flights and evening during this time of year. Stop by the LZ and Greg Pierson is there and is a pilot and active host at the campground. There are hot showers in the bathrooms at the Geodesic Domed building. Dunlap is a regulated P3 site, but P2 pilots can fly with an approved sponsor. All pilots need to be members of USHPA and also need to be current (Annual Renewal) in regards to site fees (info below). P3 and P4 pilots should get a site intro and are required to join the Central Valley Hang gliding and Paragliding Association (CCHPA) – the club that sponsors and insures the site. The Annual Fee for Dunlap is $75 / Year and Day Use Fee is $25/ day (includes camping at Dan’s LZ. To join the club, please see the below information to Join the CCHPC club. Below is a snippet from Google Earth that shows the main flight paths from the Dunlap launch to the primary LZ. 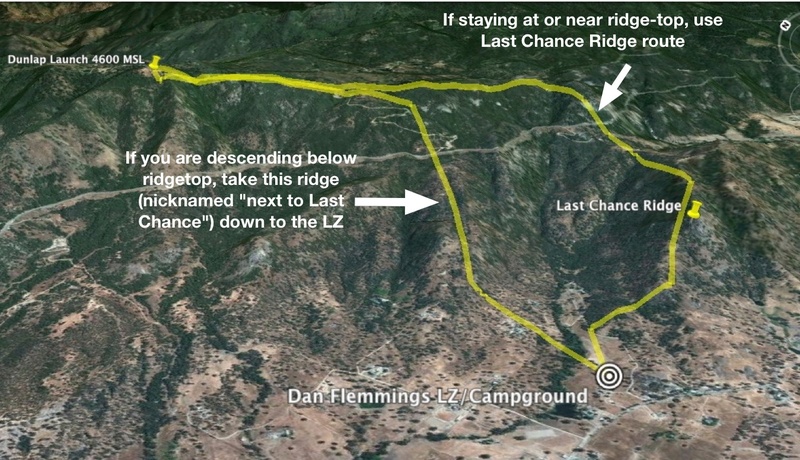 Better lift is found by staying on the back ridge and then veering to the LZ via either Last Chance, or Next To Last Chance ridges. You can go a couple different ways or mapquest it yourself, but you will want toend up on Hwy 99 S as you get to Fresno. From South Bay, you can take 101 S to Gilroy and take 152 E and go all the way to Hwy 99 and then head S to Fresno. From the East Bay, you can take 580 East to 99 S to Fresno. With no traffic, from my house in San Mateo, not too much difference which way I go, but I think with traffic, I would go the 152 route to avoid the 580 nightmare. 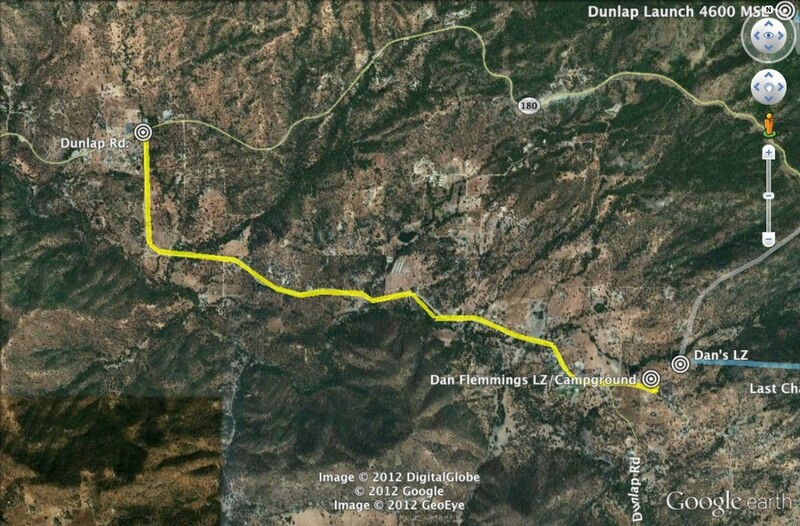 Take Hwy 180 East from Fresno to the town of Dunlap. After turning onto Hwy 180 East, continue for 45 minutes – 1 hr. Follow the signs to stay on 180 east. Continue past the town called Squaw Valley. After this, the next gas station is the beginning of Dunlap. Just after you pass the Gas Station you will see a little restaurant on the right, it is called the Hummingbird Cafe. Dunlap Rd. is the next right. Turn right onto Dunap Rd. and continue about 3.8 miles. About 1/4 mile before you reach Milwood Rd., you will see a School on the right. Shortly after you pass the school, not even 1/4 mile, look for Millwood Rd. on the left. Look for the 5th driveway on the left. There is a geodesic dome on the campground property. Take the road just after that in to the camping area. There is camping available in the Dunlap LZ / Campground as well as cabins called the Sequoia Highlands, just walking distance from the launch. There are also dorm rooms and camping available at Sequoia Highlands. A new venue for dorms and rooms that some pilots now say is the best is the St. Nicholas Retreat. Full contact information is available at the page http://dunlaplanding.com/ . Directions to the LZ above will get you to Dan’s LZ. After following the previous directions to the LZ, but before you turn off onto Dunlap Rd., continue straight ahead on Hwy 180. You will start winding up into the mountains. I think it is about 10 minutes up the road, on the left you will pass “Snowline Lodge”. A couple of turns past this, there will be a fire road – paved at first that goes up the mountain on the left. This is the road to the cabins. About a mile after that you will turn/veer left onto Milwood Rd. (I think this is unmarked…). (There are signs on route pointing the way to Sequoia Highlands.) Sequoia Highlands is 4.2 miles from Hwy 180. The next two intersections follow the signs that either say Delilah Lookout or Sequoia Highlands. When you reach the highest point of the mountain, the cabins will be on the left. Below, are the directions I found on the Sequoia Highlands site, but I think with the above directions you should be able to get there.